Let’s talk about elegant alternative spellings. Most alternative spellings make a name seem a little trendier. Olivia might rank in the current Top Ten, but it’s Alivia that feels especially twenty-first century, and Alyvia even more so. Chloe has history, but Khloe wasn’t really on our radar until we started keeping up with the Kardashians. And yet, a handful of names work in the opposite direction. They offer elegant alternative spellings, ones that make them seem a little more sophisticated. 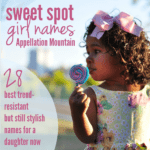 Of course, the more common spellings are flat-out gorgeous, too – but this might appeal to parents after something just a little bit different. Sure, they might still cause spelling headaches. 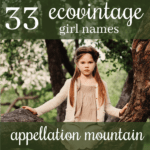 But for these six girl names, maybe it’s worth it. Beatrice dominates in English. 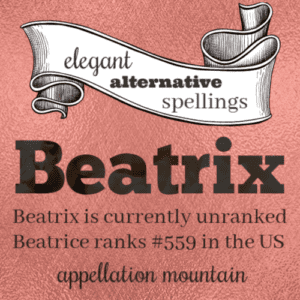 But the -x ending brings to mind Beatrix Potter, and spunky nickname Trixie, too. It reveals more of the name’s Latin roots – Viatrix was a Latin name meaning voyager. (The name picked up the current spelling thanks to the Latin word beatus – blessed.) Factor in our love of the letter x, and this name blends traditional sophistication with twenty-first century cool. 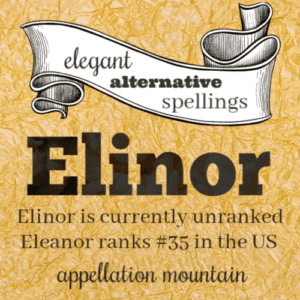 Eleanor belongs with the classic girl names currently near the top of the popularity charts. It’s regal and accomplished, with great nickname options. Elinor takes the name in a more Jane Austen direction, thanks to enduring heroine Elinor Dashwood of Sense and Sensibility fame. While Eleanor is far from frilly, I think Elinor is even sparer, a restrained and elegant option for a daughter that’s just slightly different. Read more about Eleanor here. 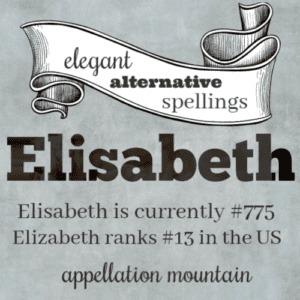 If Elizabeth is the evergreen classic, consistently the most popular girls’ name in then US, then Elisabeth is her European cousin. Used in French and German, as well as English, Elisabeth feels just slightly more sophisticated than the familiar ‘z’ spelling. It also helps explain so many Elizabeth nicknames, from Leisel to Elise to Lisa. Actor Elisabeth Moss is the current standard-bearer for this spelling. Isabella and Isabelle are heard everywhere, but how about Isobel? It appears from time to time, often in historical fiction. It’s considered Scottish. On Downton Abbey, Matthew’s mom answered to Isobel. Does it get any posher than that? On Grey’s Anatomy, Izzie was an Isobel, too. Despite these major pop culture figures, this stunning spelling is all-but unknown. Read more about Isabella here. It’s the spelling favored by legendary actor Katharine Hepburn. Former Washington Post editor Katharine Graham was Katharine-with-a-K-and-an-extra-a, too. It might come from the German Katharina, but lots of language and moments use the extra ‘a’. All of those high profile uses push it into the elegant alternative spellings category. Read more about Catherine here. Current US popularity rank: #368. 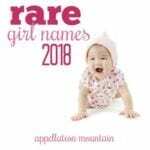 Madelyn ranks #63; Madeline #100; Madilyn #338; Madelynn #459; Madilynn #555; Madalyn #660; and Madalynn #820. 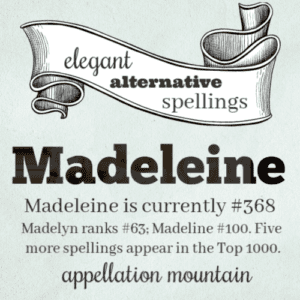 Madeleine is French, and that ups the name’s sophistication factor. Possible spellings abound, and the -leine ending is by no means most popular, but it’s not the least, either. Many possibilities seem calculated to ensure a specific pronunciation. Madeleine, on the other hand, might confuse some. It brings to mind Madeleine Albright, L’Engle, and the, of course, the delicious cookie. Read more about Madeleine here. Those are my picks for the most elegant alternative spellings. What have I missed? And do you prefer any of these to their more mainstream counterparts? I’m an Ashlie – non-standard spelling and I always quickly spell it when I give it out to be written down. But it already has two completely mainstream spelling options – Ashley and Ashleigh (at least here in Australia they’re mainstream, I don’t know about America). Bizarrely though I sometimes get people who just assume they know the correct spelling without checking, even though they know perfectly well there are two normal ways to spell it. I happen to be neither, but why would you just assume? How about Hester instead of Esther, or Mathilde instead of Matilda? Spellings from other countries do up the elegance factor. Elisabeth and Elinor are so graceful. 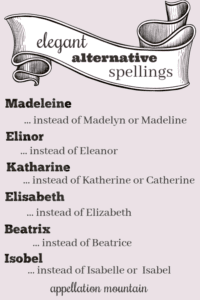 I do prefer Beatrix to Beatrice, Isobel to Isabelle, Madeleine to Madeline, and Elisabeth to Elizabeth, but as for the others…I still prefer Catherine and Eleanor myself. And I am with @Dana on preferring Gwendolen to Gwendolyn. I can’t explain it, but I do. These are lovely alternatives. I think these names fall into “elegant” rather than trendy is because the spellings are INTUITIVE to the sound of the name. I especially like Isobel and Elinor and Madeleine. However, I do see alternative pronunciations in these spellings – and alternative nicknames. Elinor, for example, could be an Elin (or Ellen), which I would never do for Eleanor (I’d do Ellie, Norrie, or Nell). Isobel seems like a name unto itself to me and has that desired “O” sound. 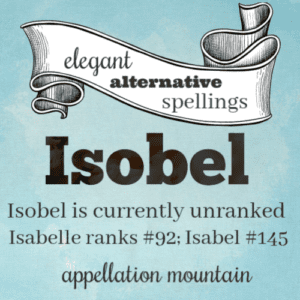 I rarely meet Isobels, but I usually have an Isabelle/Isabella in my kids’ groups and classes. Isobel and Elisabeth are such beautiful choices. I also prefer Gwendolen over Gwendolyn and Susanna more than Suzanna. 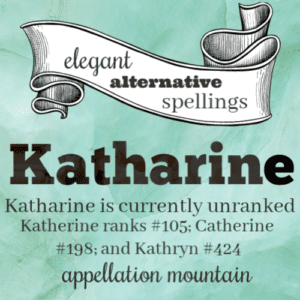 I have a Katharine names after St. Katharine Drexel. I’m also thinking Theresa qualifies as an alternative elegant spelling now. It’s defintiely my preferred spelling. Katharine is definitely my favourite of all her spellings. Plus, I always liked Briony more than Bryony.